Workman Publishing Company, 9780761176473, 32pp. Carolyn Sloan is a music educator at the Berkeley Carroll School in Brooklyn, New York, and the author of Finding Your Voice: A Practical and Spiritual Approach to Singing and Living. A songwriter and musician, she has been writing music for theater, television, and children for the past 20 years. She lives with her family in Brooklyn, New York. James Williamson is an illustrator, designer, and artist whose work has appeared in The New York Times and numerous children's books. He lives with his wife in Brooklyn, New York. "A delight for kids of any age! 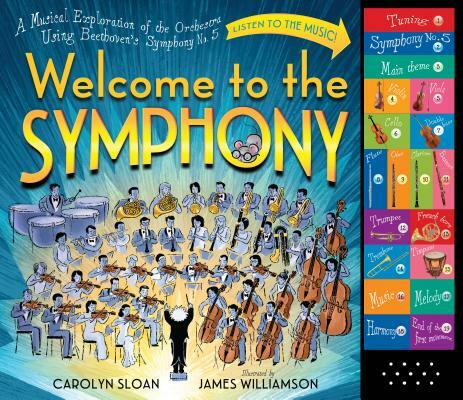 Educational, fun, a visual and aural treat, this book introduces children to the wonderful world of symphony music. With gorgeous illustrations, clear and straightforward descriptions of the instruments, and interactive buttons that play beautiful Beethoven, this will have your kids dragging you to the symphony! I simply adored it." –Terry Kinney, director, actor, and co-founder of the Steppenwolf Theatre Company.